A big congratulations to Jennifer Higdon, whose “Violin Concerto” just won the 2010 Pulitzer Prize for music. I haven’t heard the piece yet (although it’s been recorded by Hilary Hahn, and is presumably due for release soon), but if Jennifer’s other music is any indication, it’s sure to be exciting and beautiful, and — and this is high praise — fun. She has purely serious works, but one thing that strikes me about her work is its personality, and its willingness to recognize that music can show a sense of fun while still providing real substance. It brings me to this, my favorite photo of all time, because today, it becomes relevant once again. 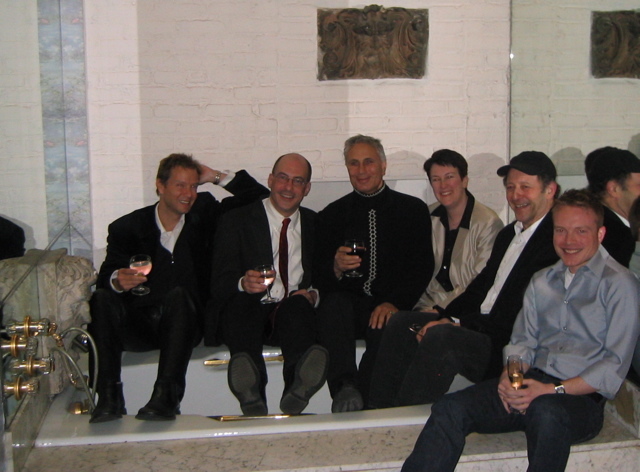 This photo, from a party in January 2004, is a shot of Mark Adamo, Robert Spano (Music Director of the Atlanta Symphony), John Corigliano, Jennifer Higdon, Steve Reich, and… me. The reason I post it today is to point out that this photo now shows THREE Pulitzer winners: Corigliano, Reich, and Higdon. Note that those three are all sitting next to each other, and that the next person in the line is… me. Clearly the pool of winners comes from this bathtub. You’ve got my number, Pulitzer committee. Also, congratulations to Tom Kitt, who won the drama Pulitzer for Next to Normal. I knew Tom back when I lived in NYC, and my best bud Damien Bassman was the drummer in the Tom Kitt Band. (Damien, for whom I wrote my first Percussion Concerto, was the drummer in Next to Normal.) Back in the day, Tom asked me to provide orchestrations for a song on his first CD, but I was busy at the time and flaked on him. So imagine my surprise when Tom won the Tony awards for not only Best Score — but for Best Orchestration. Sigh. I could’a been a contender! On the same concert they are also doing the Mozart Grand Partita for 13 wind instruments. should be a good program. Next to Normal should have also won the Tony for Best Musical. But alas, Billy Eliot took it’s place. I LOVE Next to Normal!!!! This is a useless comment. But, I felt it was much needed. I saw that performance with Hahn and DSO and it was spectacular!